McEwen Mining Inc. (NYSE: MUX) (TSX: MUX) is an American company (Colorado Incorporated), with the goal of qualifying for inclusion in the S&P 500 Index, by creating a profitable gold and silver producer, focused in the Americas. 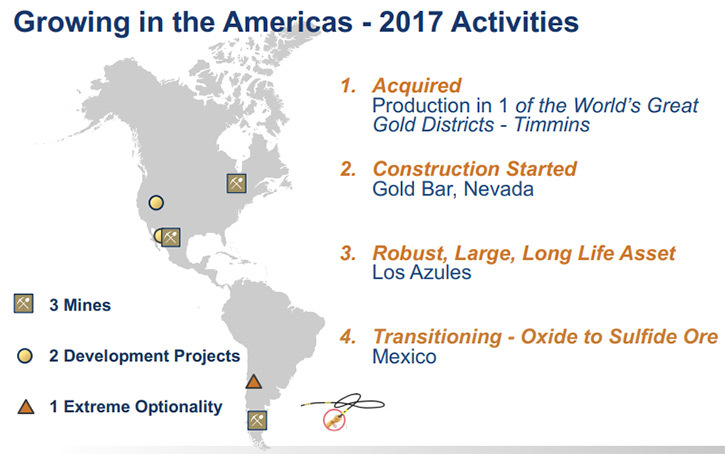 Mr. McEwen’s principal assets consist of 3 producing gold and silver Mines; San José Mine in Santa Cruz, Argentina (49% interest); the El Gallo Gold Mine in Mexico, the Black Fox Mine in Timmins, Canada, 1 new gold mine under construction- Gold Bar located in Nevada; 1 silver deposit, waiting for a production decision, above $18/0z silver; and El Gallo Silver project; and 1 very large copper deposit in Argentina: Los Azules copper project. We learned from Mr. Rob McEwen, Chairman and Chief Owner of McEwen Mining, that the reason the company is looking to qualify for the S&P 500, which represents 80% of the equity capital in the country, is that they expect a big wave of investment in gold in the near term and the great bulk of the buying will go into gold stocks in the S&P 500. According to Mr. McEwen, we are entering a period when commodities will be increasing in value. Plans for 2018 include a $10 million exploration program at their new property in Timmins, Canada. Their Gold Bar Mine will take about a year to build, and is forecast to start commercial production in 2019, producing just over 65,000 ounces of gold and at a cash cost of $800 an ounce. Dr. Allen Alper:	This is Dr. Allen Alper, editor-in-chief of Metals News, talking with Mr. 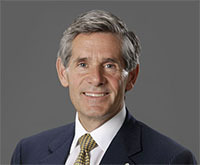 Rob McEwen, Chairman and Chief Owner of McEwen Mining Inc. I wonder if you could tell our readers/investors your thoughts on the gold market. What is happening now and what you see in the future? Mr. Rob McEwen:	Certainly, Al. I'll start with a Happy New Year. I think 2018 is shaping up to be an interesting year for gold investors and precious metal investors. I'll refer to a chart below that plots a ratio created by dividing the Goldman Sachs commodity index by the S&P 500 Index. 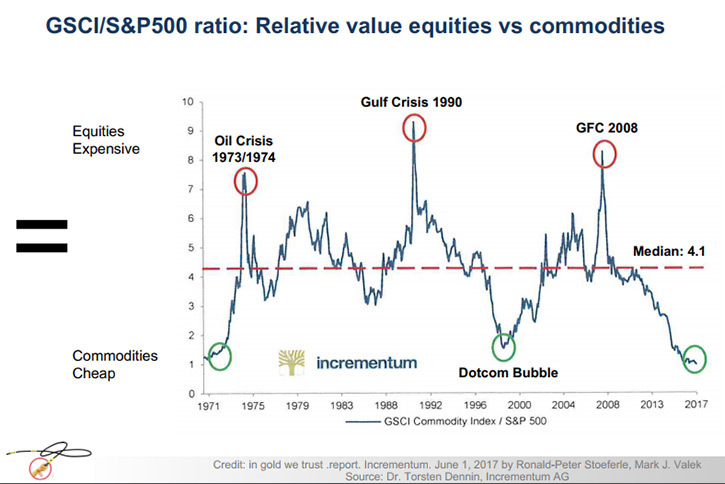 This ratio shows the relative market value of equities versus commodities over a period of time. Right now, the ratio is at the lowest point it's been for 45 years. There have been two other occasions when the ratio has been close to this point, in 1971 and 1999. These were good times to buy commodities and precious metals. Let me explain the meaning of the ratio. When the ratio is below four, commodities are cheap, relative to equity values and when the ratio is above four equities are cheap relative to commodities. Today commodities are very cheap and equities are very expensive. This chart suggests two important observations. One, we are close to the bottom of the commodity price cycle and the duration of the commodities cycles has averaged 14-16 years. We appear to be entering an extended period, where commodities will be increasing in value. 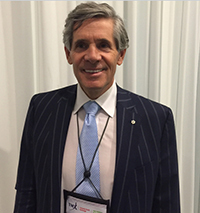 Dr. Allen Alper:	That sounds very interesting and exciting for our investors in gold and in mining stocks. Dr. Allen Alper:	That's great, I appreciate it. What do you think will drive the prices of gold? What’s happening in the world today that might start to change this ratio? Mr. Rob McEwen:	First, let’s talk about the value of gold in various currencies, between September 5, 2011 when gold reached $1920/oz and today. In US dollars the gold price is down 29%. But if you were using Japanese Yen, the price is actually up 1%. The price of gold depends on what currency you are using and where you are living in the world. The Chart below will provide you with the varying performance of gold in six (6) currencies. Now, today we have a somewhat similar situation to what occurred between 2001 and 2005 when the price of gold was rising quickly in dollar terms, but not in the other major currencies. However, after 2005 it started moving up in price in the other currencies and the price of gold began its rapid rise. Today we have the reversal of what happened between 2001 and 2005. Right now, the dollar price of gold is down, but it's been moving up in other currencies. 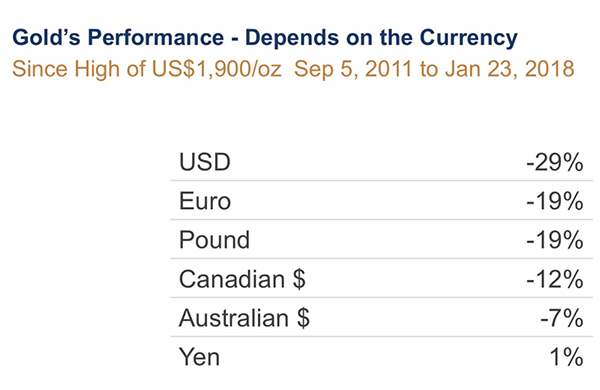 I think, once the gold price starts moving up in dollar terms, it will accelerate its climb in all currencies. That's when a lot of investors will start piling into the market. The other fact to keep in mind is that gold is very, very under-owned in America. If you were to look at the total market capitalization of all the public companies based in America today that would be about $31 trillion dollars. Of this amount, the combined market capitalization of S&P 500 Companies in equal to 80% or approximately $25 Trillion. You may find this surprising that there is only one gold stock in the S&P 500. It is Newmont Mining and its total market value is $22 billion. So, the gold exposure of investors in the S&P 500 Companies is determined by dividing $22 Billion by $25 Trillion. The exposure is a tiny 8/100 of 1%. Stated another way, if there were a change in investor sentiment towards gold and it increased to 1% of the S&P 500’s combined market cap, the impact on the gold market would be huge, particularly those gold stocks in the S&P 500 Index. An increase to 1% weighing in gold would cause $200 billion of new money going into gold. That amount is equivalent to more than 11 new Newmont’s. There's a very successful hedge fund manager, Ray Dalio, who runs Bridgewater Associates, one of the largest hedge funds in the world. In August 2017, he recommended that investors look at putting 5 to 10% of their portfolio in gold. If we ever saw a movement like that, there'd be a gigantic amount of money moving into the gold space, having a very positive impact on the price of gold. Maybe half of that might go into gold bullion and coins. The balance could go into gold shares. MUX’s goal is to qualify for inclusion in the S&P 500. 1. It is critical to understand that only a very small number of gold producers can gain admittance to the S&P 500 index. The first criteria is the company must be American, which McEwen Mining is. That eliminates 99% of all the gold producers worldwide. 2. Given the growing presence in the market of passive investment management, index investing and ETFs, the importance of being in the S&P 500, the largest segment dominant index in the market cannot be overlooked. 3. Being in the index provides a competitive advantage. That is the reason for MUX to reach for our goal of being included in the S&P 500. Dr. Allen Alper:	That's very interesting and insightful information. Could you give our readers/investors, more insight on investing in physical gold, majors, and juniors? Mr. Rob McEwen:	Certainly. When you're looking to buy gold, you have a number of options. First, you can buy physical gold from a bullion or coin dealer. If you're buying a large quantity you will want to go to a recognized bullion bank. Where you store your gold is a critical decision because once gold bars get out of the banking system, there are not the same guarantees that someone hasn't tampered with it. If you want to sell your gold the buyer might have to have some testing done to ensure the gold hasn’t been tampered with. You will have to cover the cost of testing. First. You could buy coins. There's usually a premium on coin over the gold price, but you have lower denominations and you can use that for exchange much easier than a bar. Second. You can buy shares in a number of publicly traded, closed end funds, listed companies that hold gold and silver. From time to time these companies’ shares sell at a discount to market and that's a good time to buy. Other times they sell at premium of 10, 20, even 30% above the gold value that they hold. Third. There are gold and silver bullion exchange-traded funds or ETF's they are similar to the closed end funds. Fourth. There are the equities and, depending on your confidence level and your knowledge level. If you have bought gold equities before, you should consider buying shares of a gold ETF that invests in a diversified portfolio of gold mining companies. The management fees are lower than most mutual funds and closed end funds. Fifth. You can make investments in individual gold exploration and production companies. There is a wide spectrum of choice ranging from the seniors, intermediates, and junior gold producers and below that you have a group of exploration companies. The senior companies traditionally have better balance sheets, they have production and income. The intermediates’ balance sheets might be more encumbered by debt, but they often have faster growth rates than the majors. It's often one step down in quality, but more upside in growth. The junior producers certainly have the fastest growth in the producing sector, but often they're constrained by limited financial strength and often one source of revenue. Also you need to watch out for companies that have further encumbered their future revenue stream by selling forward their gold in the form of a hedge, or a royalty or a metal stream. All of these financial devices limit a company’s future revenue growth on a raising gold price environment. In the exploration area, there are hundreds of exploration companies exploring around the world and these can be very exciting positions to own if they make a big discovery. Big discoveries aren't that common, but in a rising gold market a lot of these stories generate quite a bit of excitement. You can see very large moves in their share prices. Of course, they go both ways, up and down. For myself, I invest in exploration companies and the junior to intermediate sized producers. For me these companies produce the more exciting ride and the larger returns. How you invest is determined by your risk tolerance. If you want to minimize the risk in your gold investments you should look to investing in mutual funds, ETF or shares of the senior producers. 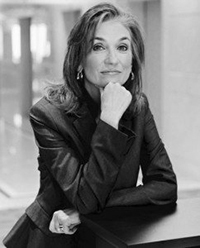 Dr. Allen Alper:	I appreciate the great insight you're giving our readers/investors. That's very helpful to them and gives them a much better understanding of the choices of the type of investment they could make. I know 2017 has been an extremely exciting time for McEwen Mining, a lot of wonderful things have been going on. I wonder if you could highlight what has happened with McEwen Mining over the past year and some of your plans for 2018? Mr. Rob McEwen:	Certainly, Al. You're right, 2017 was an active year for us. In the spring we purchased a company called Lexam VG, which had property in Timmins, Canada. Timmins is one of the largest gold mining districts, not only in Canada, but also in the world. The area has produced in excess of 100 million ounces over the last hundred years. The attraction of Lexam VG was its four properties that had past production. Three of the properties are adjacent to the 100 year old Dome Mine owned by Goldcorp. These properties had previously been mined by underground methods. We believe there is an opportunity to reopen these properties by both open pit and underground methods. We are assessing which of these properties we want to develop first. Later in the year, in October we purchased another property in Timmins, an operating mine, a short distance away from the assets we purchased earlier in the year. The mine we purchased in October was called the Black Fox Complex, we bought it from Primero Gold, who had bought it in 2014. We think we got a good price. Primero purchased the property in 2014 for $300 million, they assumed $140 million of liabilities, and put $120 million into development and exploration. Primero’s total investment in this asset was $560 million and we purchased it for $35 million. We paid six cents on the dollar. Why did we get it so cheaply? Primero was a distress seller, under pressure, from debts, tax problems, labor problems and a difficult metal streaming arrangement. They were being pressed to the wall, so they were a forced seller. We had money at the time, which allowed us to offer a short time to close the purchase. We were able to purchase an operating mine at Timmins for $35 million. 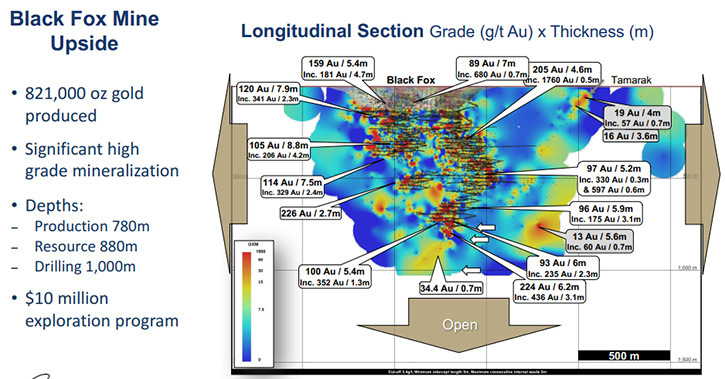 We ended up with an underground mine producing 40 to 50,000 ounces a year, it came with 1.2 million ounces measured and indicated resources, another 200,000 million ounces of inferred resources, along with a number of exploration targets. It came, also, with $150 million of tax pools, which will allow us to shelter a large part of our income for many years going forward. It also has an operating mill and tailings area permitted that has excess capacity that will allow us to process ore from the Lexam VG properties that we purchased in the spring of 2017. These properties are within easy economic trucking distance to the Black Fox Mine’s mill. This was a strategic investment that diversified and increased our production base, provided a facility to process our Lexam ore and positioned us in Timmins, one of the best gold producing areas of the world. Our 2018 exploration budget for Timmins is $10 million. Another important development for MUX occurred in late August when we released a preliminary economic assessment (a PEA) on our Los Azules Copper Project, located in Argentina. This PEA looks at the improved project economics as a result of economic incentives put in place by the new government in Argentina. They've taken significant steps to improve the business community and the environment for foreign investment. As a result, there was compelling economic reason to change our development plans. The resultant capital reduction was significant from $3.9 billion to $2.4 billion. This project is modeled to pay back in 3.6 years and has a 36 year mine life. In the first 13 years of operation it is projected to have annual production of 415 million pounds of copper at a cost of $1.14 per pound. To help your readers appreciate the size of this project, allow me to do some alchemy. If we convert the forecast annual copper production into a gold equivalent the 415 pounds of copper would be approximately 1 million ounces of gold. And at a cost of $1.14/lb of copper would be equivalent to $500/oz of gold production cost. It's quite exciting. However, it's a project that's clearly beyond our balance sheet. We're looking to joint venture, with a larger company that has the capital and experience to develop such a large project. Another important development happened in early November, when we received our long-awaited permit from the Bureau of Land Management to start construction and operate our Gold Bar Mine. We started doing ground preparation at Gold Bar immediately after we were issued our permit and we were able to start drilling. Our exploration objective is to extend the life of the Mine. 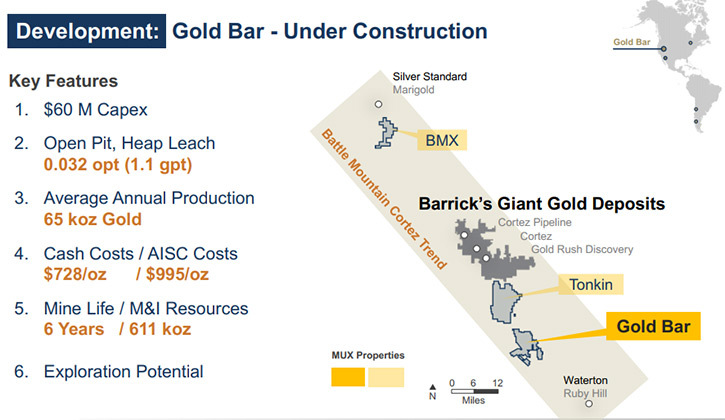 Gold Bar will take a year to build. We expect to begin commercial production in 2019. Average annual gold production is expected to be 65,000 ounces of gold at a cash cost of $800 an ounce. The resource grade is 1 gram/ton oxide ore. It will be a heap leach operations with a low capital cost of $75 million. 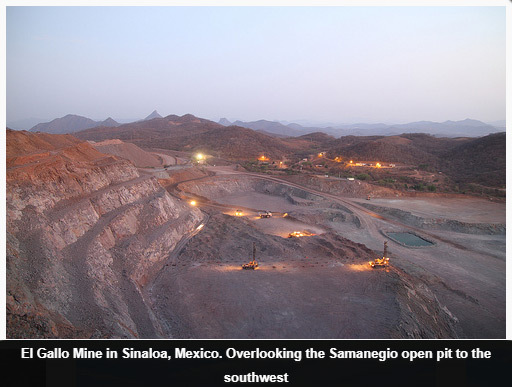 In Mexico, our El Gallo Mine is an open-pit, heap-leach gold Mine, which is nearing the end of its life, at least as far as mining the oxide ores. We've been building a resource base of sulfide ore. This ore type would require an additional capital investment in order to recover the gold economically. At the same time, 5 miles away from the gold Mine, we have a silver deposit on which we have been reworking the economics. It requires a silver price above $18 before we want to put money into the ground and build a Mine. When we look at a new project, it has to meet two criteria: First, 20% after tax internal rate of return and second, a payback of capital in less than three years. Our corporate goal is to qualify for the S&P 500 Index. That means we have to grow, so we're looking for further M&A opportunities that will increase our annual production and exploration potential. We prefer buying distressed and underpriced assets. Our future growth needs to produce a higher share price, otherwise it is not worth doing! Dr. Allen Alper:	That's an amazing program, amazing progress, and wonderful projects that you have. It sounds like 2017 was an outstanding year. 2018 seems to be shaping up to be a fantastic year as well. Great work! Maybe you could tell our readers/investors a bit about your team, your board, and yourself. I think everyone knows about your record. Your achievements are well-known, but maybe you could highlight it for our readers /investors. Mr. Rob McEwen:	Certainly. After college, I started working in the investment industry. 18 years later I jumped into the gold mining industry, where Mother Nature has treated me and my shareholders very well. McEwen Mining is debt-free. Our treasury has about $60 million in liquid assets. I own 24% of the company, my cost base is $133 million. My salary is $1 a year and I have elected not to receive any bonuses or options. I was inducted into the Canadian Mining Hall of Fame a year ago. I was very pleasantly surprised to receive Kitco's nomination of mining CEO of the year in 2016 and in 2017. I was awarded the Order of Canada, the Country’s highest civilian award. I have a reputation for being an innovative maverick. Dr. Allen Alper:	That's outstanding. Mr. 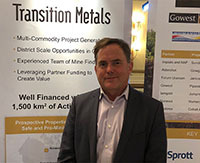 Rob McEwen:	Before McEwen Mining, I had the pleasure of building a company called Goldcorp Inc, which is now the third largest gold producer in the world by market cap. I built it over a 19 year period. I am proud to say that my shareholders did very well. We enjoyed a very strong share performance. In the last 13 years I was at Goldcorp, our share price compounded on an annual basis in excess of 31% a year for 13 years. This type of share performance is exactly what I would like to repeat at McEwen Mining. The reason for this goal is to use my profits to fund medical research for regenerative medicine and stem cells. My wife and I are very active supporting research in this area. Researchers that we have supported have been having award-winning success. They are changing the future of medicine. We’ve been adding to our management team. Our Chief Operating Officer, Xavier Ochoa, has held senior roles with some of the largest gold and copper producers, Xstrata, Goldcorp and Barrick. Our SVP Projects, Donald Brown, who is responsible for our Los Azules project, has extensive experience with the planning, building and running of a large copper mine, globally coordinating our Los Azules property. He was with Bechtel, Xstrata, and Glencore. Our head of exploration, Sylvain Guerard, most recently was the head of global exploration for Kinross Mining. Before that he was with Barrick Gold and Inmet Mining. He has extensive experience running exploration teams around the world. Our CFO, Andrew Elinesky, has been with me for about 10 years now, and has a strong industrial background. I think it is useful to have an outside perspective looking at our financials. On our Board of Directors, we have a great group of skilled individuals, with backgrounds ranging from exploration geologist, mining engineer, mining research analyst, investment industry (Buyside, Sellside), serial entrepreneurs, public accounting and large private investors. Dr. Allen Alper:	That sounds outstanding! Sounds like you have a great team. You, of course, have been an outstanding leader in the mining industry, and you have had some wonderful projects. What are the primary reasons our high-net-worth readers/investors should consider investing in McEwen Mining Inc.? Mr. Rob McEwen:	Thank you Al. We are listed on the New York and Toronto Stock Exchanges, McEwen Mining's symbol is MUX. Our three-month average daily trading volume is better than 3 million shares. Most of our shares trade is on the New York Exchange. In addition, we have a very high beta of 2.7 times, meaning we move 2.7 times the move in gold according to Bloomberg. The six key reasons your high-net-worth readers/investors should consider investing MUX are: First. Greater market liquidity, easy to buy or sell. Second. Strong alignment with Shareowners. I own a big position in the company, 24%. My cost of this investment is $133million. My financial commitment is very high for any CEO in the industry. Also, the only way I am going to make any money is exactly the same way all my Shareowners will make money. That is with a higher share price because my annual salary is $1 and I have elected to take no bonus or options. Therefore, if the share price doesn’t go up, I suffer that pain, just like they do. I’m interested in growing a bigger company, only if getting bigger also means a higher share price! Third. We are an American company, with big goals providing good exposure to gold, silver and copper. Our Mines are located in the Americas. Our newest mine, the Gold Bar Mine in Nevada is under construction and will be operating in 2019. Fifth. Growing Production and Good Exploration Potential. Over the next three years we are projecting annual production to grow by 40% to 215,000 gold equivalent ounces (gold and silver). Sixth, If an investor is looking for an alternative to buying a leveraged gold ETF, they should consider us. We’re like a leveraged ETF in terms of share performance, but we don’t have any debt. Dr. Allen Alper:	Very compelling reasons for our high-net-worth readers/investors to consider investing in McEwen Mining Inc! Outstanding, Rob! Is there anything else that you'd like to add? Mr. Rob McEwen:	I just hope everybody has a very successful 2018. 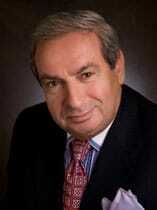 Dr. Allen Alper:	Thank you. I hope McEwen Mining has a very successful 2018 as well. My family and I really appreciate your charitable contributions to medical research. You’ve chosen to support a pivotal area of medical research that is uncovering such basic medical knowledge that it will generate treatments and cures for ills and conditions in multiple areas of medicine not possible today. It will really reduce human suffering! Mr. Rob McEwen:	Thank you. Research in Regenerative Medicine and Stem Cell research holds out the promise of profoundly improving the delivery of healthcare to people around the world. If we can take some of the money that Mother Nature has helped us generate and spread benefits far beyond our own lives and activities then if feels like we are doing something right. Disclaimer: The Alper family own McEwen Mining Inc. stock.